From 1550 to 1850, Earth mysteriously got colder. Communities from Greenland to the Alps were swallowed up by glaciers, and bodies of water like the Baltic Sea and Manhattan Harbor froze over. But what caused this Little Ice Age? A lot of explanations have been put forward to explain this mysterious cooling, including particularly weak solar activity, changes in the Earth's orbit, and just the general variability of climate over time. Indeed, one of the more intriguing proposals is that the massive waves of death that struck the human population - first with the Black Death in the 14th and 15th centuries, and then the widespread death of indigenous Americans after European contact - caused massive amounts of former agricultural land to become forests again, absorbing lots more carbon dioxide and cooling the planet. They're all intriguing theories, and it's certainly possible that a combination of more than one of these could have played a role in sparking the Little Ice Age, but the precise cause of it all has remained elusive. Part of what makes this mystery so difficult to solve is that no one knows exactly when the Little Ice Age got started - we know its effects kicked in around 1550, but it's likely that Earth's climate was quietly cooling down long before that. Now an international team of American, British, and Icelandic scientists think they may have located the main culprits behind the Little Ice Age: a quartet of massive eruptions by tropical volcanoes. Around 1300, there was a fifty-year period in which the four volcanoes went off, shooting up enough ash and aerosol particles into the atmosphere to make summers to blot out sunlight and make summers cooler. That in and of itself was just a temporary effect, but it kicked off a chain reaction that would almost freeze Europe solid 250 years later. According to the scientists' computer simulations, these volcano-cooled summers would cause sea ice to expand, sending huge glaciers hurtling down the then relatively temperate Greenland coast. As the sea ice reached the North Atlantic, it would have melted, mixing with the regular ocean water. "This is the first time anyone has clearly identified the specific onset of the cold times marking the start of the Little Ice Age. We also have provided an understandable climate feedback system that explains how this cold period could be sustained for a long period of time. If the climate system is hit again and again by cold conditions over a relatively short period-in this case, from volcanic eruptions-there appears to be a cumulative cooling effect." To support their model, the scientists have identified over 150 samples of dead plant material from newly uncovered ground on Baffin Island in the Canadian Arctic. Carbon dating revealed that a huge number of the plants had died between 1275 and 1300, which definitely suggests some short-term climate catastrophe - like a series of massive volcanic eruptions, say - washed over the world around that time. Analysis of the annual layers of sediment trapped in an Icelandic glacial lake also show signs of a cooler climate in the late 1200s, supporting the idea that this was a global phenomenon. The Little Ice Age seems unreal to us today, and it brought its fair share of tragedy - the Norse colonies in Greenland were among the first wiped out by this period of cooling, and advancing glaciers destroyed mountain communities. Crops failed in the colder temperatures, sparking devastating famines, and historian Wolfgang Behringer has suggested that the revival of witch-hunts was a reaction to the otherwise mysterious loss of agriculture. But this transformed world also left some remarkable images and stories of how the world dealt with this unprecedented cold. 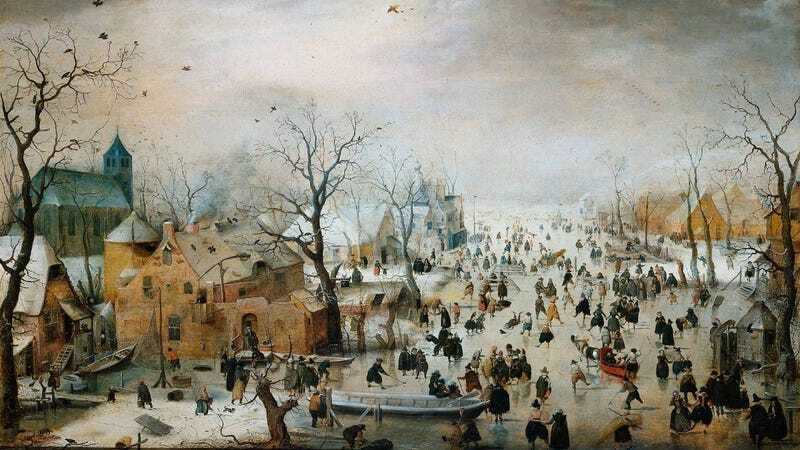 In Europe, artists generally interpreted the world as one gigantic ice skating rink, as you can see in the painting up top created by Hendrick Avercamp in 1608. Across the world, people could walk on ice from Manhattan to Staten Island, and makeshift inns were set up on the frozen Baltic Sea as people sledged from Poland to Sweden. For more on The Little Ice Age, check out Brian Fagan's The Little Ice Age: How Climate Made History. Scientific paper in Geophysical Research Letters.